What’s Dutch for “told you so”? Some 50,000 fewer passengers are expected to use Amsterdam Schiphol airport, one of Europe’s busiest, this summer on account of a Dutch environmental tax on flights, it was reported Saturday. “We’re expected zero growth in 2008, and in fact a decrease (in passenger numbers) in July and August,” an airport spokesman was quoted as saying by the domestic ANP news agency. Douglas Gawadzinski, one of the apparent problem personnel in the FAA office overseeing Southwest Airlines — and designated FAA fall guy — has “retired,” FAA official said. [Dallas Morning News] See more on this. The airlines blame the Department of Homeland Security for foisting its exit process — and related costs — onto the industry. [ATW Daily News] See more at Daily Airline Filings. Lots of interesting testimony at today’s Senate Commerce Committee hearing on climate change and transportation. Discussion subjects ranged widely, from surface transportation to the possibility of shipping in the Arctic. “The transportation sector accounts for approximately one-third of U.S. greenhouse gas emissions,” announced committee chairman Daniel Inouye (D-Hawaii). He added that GHG emissions from transportation are projected by the EPA to increase by 26 percent by 2020. Will aviation biofuels mitigate net climate change? Virgin’s much-ballyhood flight from London to Amsterdam used 5% coconut-oil biofuel . . . to show biofuel could take the high-altitude cold. But the test flight alone used 150,000 coconuts, Petroleum Review says—and at least 3 million would have been needed for a full biofuel flight. Multiply that by world air traffic, and the problem comes into focus. The other options? Flavor-of-the-month jatropha biofuel would be fine—except aviation would require a land area twice the size of France to grow the stuff. . . . How about biomass, like bits of wood and useless plants? Well, they still need to grow somewhere—and commercial aviation would need to harvest an area three times the size of Germany. My question: if aviation washes its hands of its climate change impact (estimated to be 2-3 percent) with biofuels, and since biofuels require more arable land and lead to the clearing of forested areas, how much does that add to deforestation’s estimated 25 percent contribution to anthropogenic climate change? The airline sector currently has no incentive to worry about this transfer of emissions, and every incentive (financial, PR, etc.) to just do it. I’ve written before about a similar but not identical problem in “green taxation,” in which one country’s aviation taxes reduce one country’s aviation carbon footprint but not the world’s, because the flights shift to other countries’ airports. In the case of biofuels, will the airline industry be able to “greenwash” away its climate sins without actually making a difference in manmade CO2 emissions? As for the extent to which widespread use of aviation biofuels will mitigate climate change, or what kind of policies or institutional structures can prevent this problem, I will leave further discussion up to those much better versed in this subject than I. Ahem, ahem. Who says airlines can’t make a profit? One of the most-voiced complaints about deregulation is that airlines have been consistently unprofitable since deregulation. That’s not true, according to this handy chart from a 2006 Government Accountability Office report [PDF]. 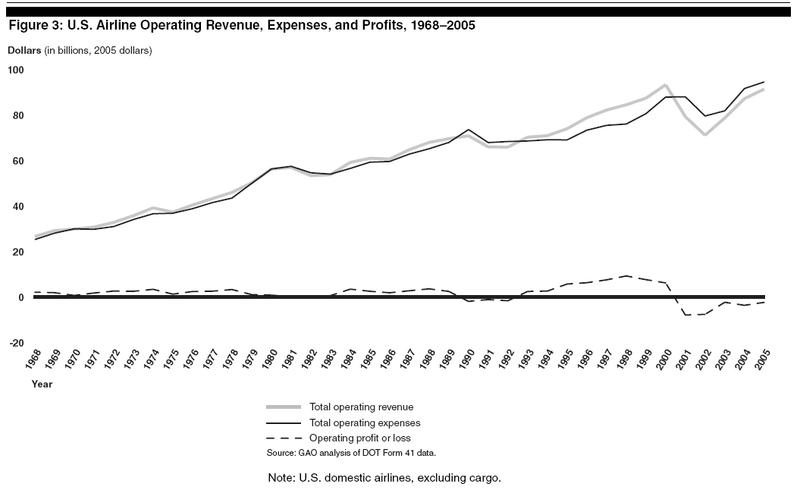 As you can see, airlines were only narrowly profitable in the era of regulation. After regulation, they became exposed to economic forces, making them — like most other industries — profitable during good economic times and less so during recessions. The airline bottom line was hit by the 1980, 1981-82, 1990-91, and 2001 recessions. The final one’s impact was exacerbated by 9/11. Even with the current challenges of the industry, it’s not possible to say that airlines simply can’t make money in a deregulated environment. Those who propose some measure of reregulation should make clear what they want: for airlines to be protected from the economic cycles and competitive pressures that almost every other industry faces.